There are a few things that I feel I have always known how to do. 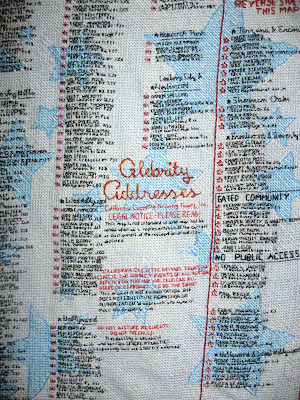 Crosstitch, make art, and watch television are three of them. I don’t know which one motivates the others anymore, but rather they all seem to be done concurrently and hold sort of equal fascination. 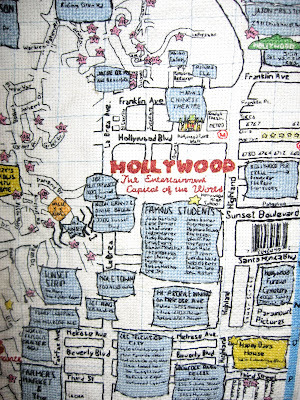 I watched over 200 movies while stitching the map, but I wouldn’t have stitched the map if I didn’t already love movies. I think this bridge of work and love extends to my subjects as well.. It’s as if by doing something repetitively with these people, by knowing where they live, I can have them as a part of my life. My work is concerned with my daily activities, my fantasies and their collision. 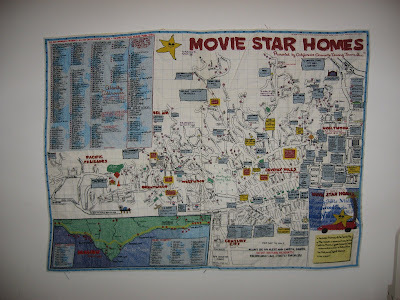 In stitching the map to the stars’ homes I have personalized an object that millions of tourists purchase. 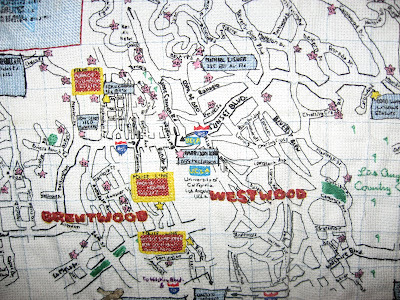 Through countless hours of reproduction I have become intimately familiar with Los Angeles’ famous addresses, landmarks, and productions. There is a literal thread between this place and me. Wow. Beautiful work, and a very cool piece! I love this project. I'm in awe. It looks amazing.